This 30 in. x 32 in. 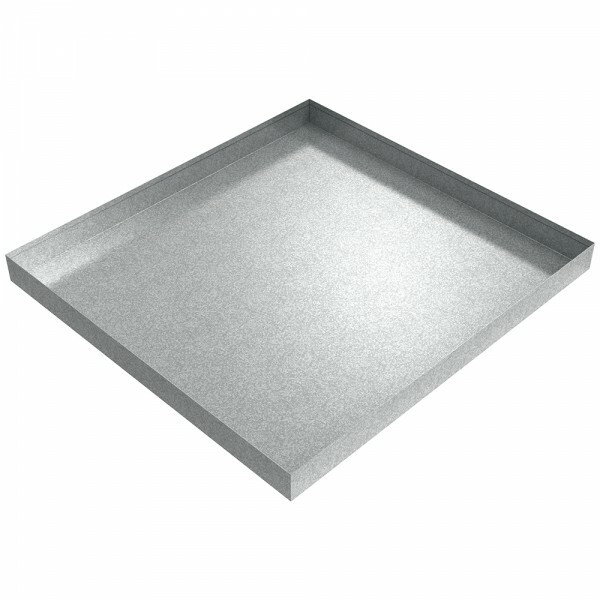 Galvanized Washer Floor Tray is the perfect solution for top-load washing machine leaks and/or spill containment. Unlike the unreliable plastic versions on the market today, this drip pan will last through the test of time. It is manufactured from heavy duty 20 gauge galvanized steel for strength and corrosion resistance. The top edges are hemmed 1/2 in. for additional strength, and the corners are welded water tight, GUARANTEED not to leak, and ground smooth for a nice smooth finish. If your application requires a different material, material thickness, powder coating, or any other custom specification, please Request a Quote and reference KM-01380. You may also download the production drawing to make edits to the dimensions of the part. Please feel free to send us an email or call us with any questions you may have. Production lead time is approximately 3 weeks.